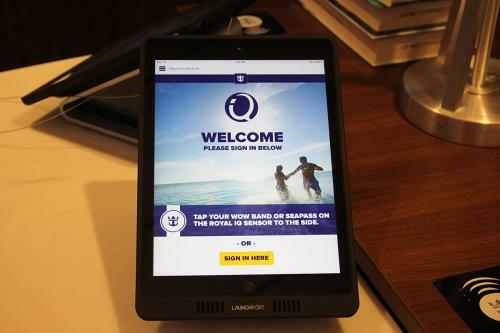 Royal Caribbean's smart phone app, Royal iQ, has been updated to provide the cruise ship's daily newspaper in digital form. Guests using the latest version of the Royal iQ app can now view their daily Cruise Compass right from on their smart devices. Royal Caribbean released the new version of the app, 1.3.99 to the iTunes App Store (Android version still appears to be on the older version) and the update description reads, "Royal iQ now includes the daily Cruise Compass. See everything happening onboard from your personal device and add the daily activities directly to your calendar to make the most out of your vacation." Royal iQ already let guests track their luggage delivery status on embarkation day, manage a personal calendar of reservations and events, communicate with other guests onboard, book shore excursions and modify existing reservations. Royal iQ only works when onboard Quantum of the Seas, Anthem of the Seas, Ovation of the Seas and Harmony of the Seas. Royal Caribbean advertises that Royal iQ will be available on Oasis of the Seas and Allure of the Seas in 2015. Royal iQ is available for iPads, iPhones, and Android phones, and available at freestanding iQ stations around the ship. Royal Caribbean also indicates future Royal iQ updates will allow guests to reserve spa treatments, schedule fitness classes, purchase Beverage Packages, and sign your electronic waivers for all of the activities such as the Rock Climbing Walls and the FlowRider. Thanks to Rich Freudenberg for alerting us to this update!